Ok, I’ll stop acting like a spokesperson for Google now and get to my point. To run your creative business, you need to be visible on the most popular search engine in the world. If you were to get even 0.000001% of those monthly searches, you’d be racking up 10000 visitors (can you tell I’m a bit of a stats nerd?). The way to get people to find you on Google is to embrace SEO, otherwise known as Search Engine Optimisation. Anyone who knows me will know that before my venture into creative design, I worked in SEO for about 3 years and I kind of know my stuff! If your SEO is good, you will appear higher in Google’s ranking system, meaning you will get much more visibility but boy do they take it seriously. The whole company is dedicated to making sure their searchers are given the best possible information and so for this to happen, you must provide them with that information. SEO is generally based on keywords which appear on your website. Say you are a photographer based in London, you want to be appearing for searches such as ‘wedding photographer london’. For Google to see you as an authority in that search, these keywords must appear on your website. 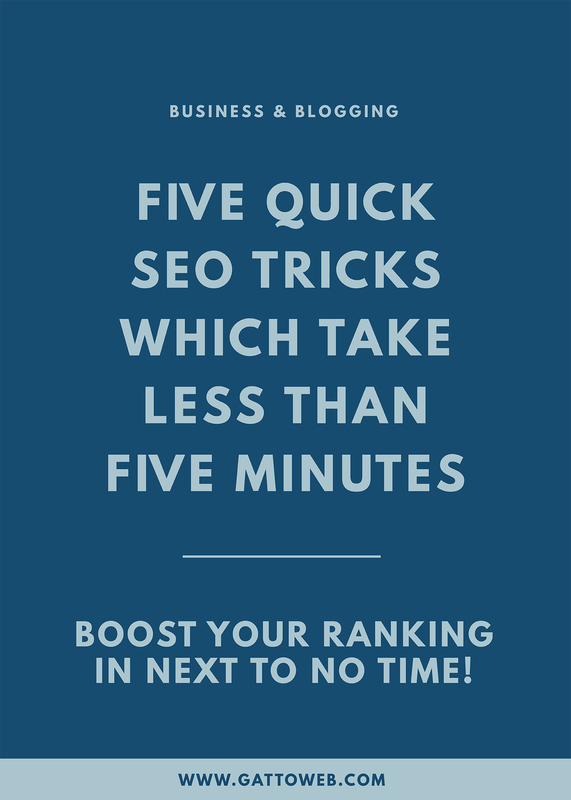 There are hundreds of ways to boost your SEO, some of which can take months and months (a post on this to come soon) but to get yourself started, below are five SEO tricks which you can add to your website in less than five minutes. I’m not even lying! Your Meta Title is the title of your website page and appears in Google search as the blue text and the main link to your site. You can add a meta title to every page on your website depending on the content. The title is important as it is the first thing people will see and can show readers what your page is about! Tip: Keep your main keywords near the beginning of the title as this is what readers will see first. Image rich websites are the best to view and adding images is one of my favourite ways to design a web page. However, what will readers see if your images don’t appear? How will Google know what content is there as it can’t read your images? The answer is Alt Tags. You can add an alt tags to your images easily and it is something I would recommend doing with every image on your website. Sounds like a pain, huh? Trust me, it does not take long at all. Make sure you include your keywords and anything relevant to the image in question. For example, for the following image from a recent blog post, I used the Alt tag ‘Branding | Website Audit | Small Biz | Creative Business’. That way I am including some of my keywords for my business website but also relevant to the post the image belongs to. To add an alt tag on Squarespace, add a caption to the image and then select Do Not Display Caption so it does not appear on the page. Tip: Include your brand name in your alt tags so they will be associated with you for image searches. Your permalink is the URL structure for a particular web page or blog post. For example, if you look at the URL of this post you will see that I have the page of the post (blog), the date posted and the title of the post. The best way to have your permalink is as simple as you can so it is easy to read and understand what the page is. Include keywords in your blog post and page titles so this appears in the URL structure and this is what Google will read. Tip: Do not change your permalink settings regularly as this will result in losing ranking for those pages. Choose a structure as early as possible and stick with it. Links to your content are a little boost in authority as far as Google as concerned. If someone links to your post, it’s like you’re getting a little bump in confidence. Getting links from other people’s website is important but can take a lot of time and is out of your hands. A good and easy way to get links is to link to your own content. If you have been blogging for a while, chances are you have blogged about similar topics several times and some of the topics will cross over. If you have mentioned something in a blog post which is relevant to a different post, add a link in! Tip: Add a ‘Related Post’ link beneath each section of your blog post as a natural way to link the posts together. Website speed can have a big effect on SEO. Google want the top-ranking websites to be functional and easy to use for the readers and speed has a big part to play in this. Your website holds a lot of information and if there is too much or if it hasn’t been optimised properly then this can delay your loading speed. Use a website speed checker tool and it will not only give you a grade for loading time, but also ways to improve, most of which don’t take long at all to fix. Tip: A simple website structure will always have a better loading speed so try to keep your pages streamlined and functional. Just think what you can do with all the time you’ve just saved yourself with these quick SEO tricks!